This one-day course is designed for those who are about to work or have just begun to work in the Construction and Civil engineering industry – to understand the potential hazards they face in their daily role. Health and Safety awareness is critical to site safety and it is important that safety training courses are undertaken by all the workforce on a construction site. 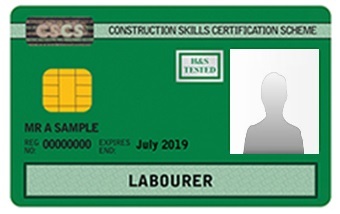 The Green CSCS Card is a must for labourers on any site, with stringent checks being carried out regularly. 2) Pass the CITB Health Safety & Environment test for operatives. This exam is also available at Red Rose Training. 3) Call 0344 994 4777 e-mail a copy of your L1 certificate In Health and Safety to the CITB and pay £36 using a credit or debit card. Your CSCS card will be posted out to you on the next working day. The CSCS card which is issued by the CITB (Construction Industry Training Board) is being demanded as proof of competence by major organisations and employers in the construction industry. CSCS cards provide proof! We offer a full range of courses including the one day Health & Safety Awareness, the two day Site Supervisors Safety Training Scheme (SSSTS) and The five day Site Managers Safety Training Scheme (SMSTS). Other courses are also available.